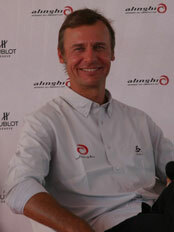 On August 25, 2009, Alinghi held a press day in Genoa, Italy. The morning was spent watching the catamaran sail in a wind that had died since the early morning training session. Thankfully, just as the crew had resigned themselves to dropping the main and going home, the breeze rallied to 5, 6 then 7 knots and the photographers in the RIBs cheered as Alinghi 5 lifted a hull for them. After that it was back to base, where an especially happy looking Ernesto Bertarelli introduced the man behind team's first AC33 sponsor, Jean-Claude Biveret of Swiss watch maker Hublot, who made no secret of his desire to help Switzerland beat America. Then it was time for Ernesto, Brad Butterworth and Murray Jones to answer questions from the media. 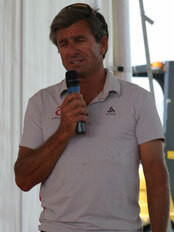 Ernesto Bertarelli: I am often asked “What is technology?”. I’ve been in biotech and now I’m fortunate to compete in the American’s Cup with technology and people ask me “Which is more important, the boat or the people?” and I always say there is no technology without people. 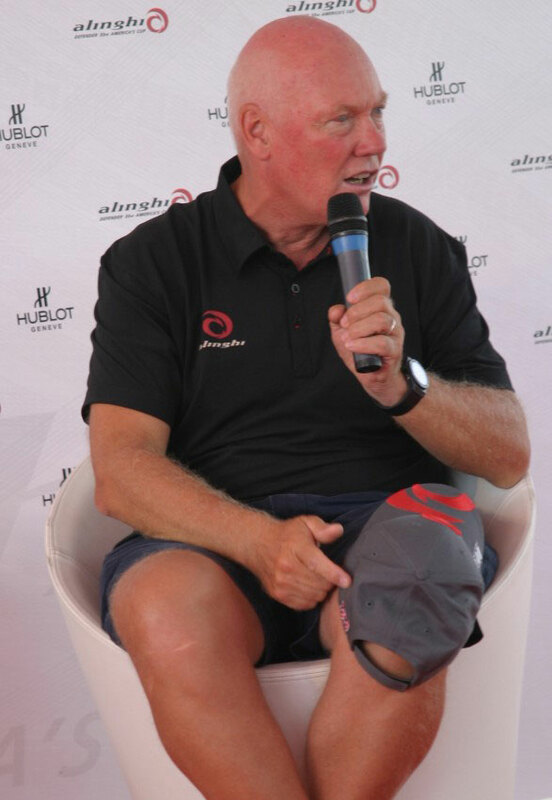 The partnership today is exactly that, in having Hublot and, more importantly, Jean-Claude joining the team is an honour to the fact that technology is about people; that people understand what it means, not only for what they are trying to achieve, but what it means in general for society. Technology is about progress, it’s about using the knowledge of people to achieve dreams and, in the particular cases of Alinghi and watch making, it is for people to enjoy, have fun and put a smile on the faces of whoever has the luck and good fortune to touch, see or experience either a beautiful watch, or a beautiful boat sailing on the water like they have today. 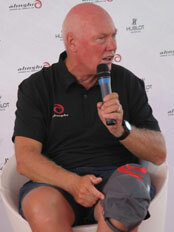 Jean-Claude Biver: For me it means incredible emotion; the emotion and the dream is love. Love is a dream, love is emotion, we are all born with love and the most beautiful thing you can have in life, besides love, is a dream. You dream during the night, but who dreams during the day? It is wonderful when you can also dream during the day and, today, I had a dream, then I had to touch myself and say it’s reality. Today, I lived the dream, today I am dressed Alinghi, I wear an Alinghi hat and my Hublot is on my wrist and I want to commit my brand, to commit my personality, my person to the success of Alinghi and I must say it is an incredible honour for me and my brand to be associated with such an incredible experience. I have one more dream …. that Switzerland, with Alinghi, is going to beat America. EB: I spoke of the people and there is obviously a very strong experience in mind and in spirit, in technology, but there is also Switzerland and Swiss made. What is extraordinary is that this boat, which is competing for the most prestigious yachting trophy in history, a trophy that has been fought for by the greatest nations in naval architecture, by maritime powers, has been built in Switzerland. It is Swiss made, with the same type of Swiss precision, care and love that goes into building watches. We have over 200 companies that helped to produce this boat, in Switzerland, and I am sure from what I was able to experience visiting Jean-Clause’s facilities, that as many companies are involved in building a precision watch, like a Hublot. 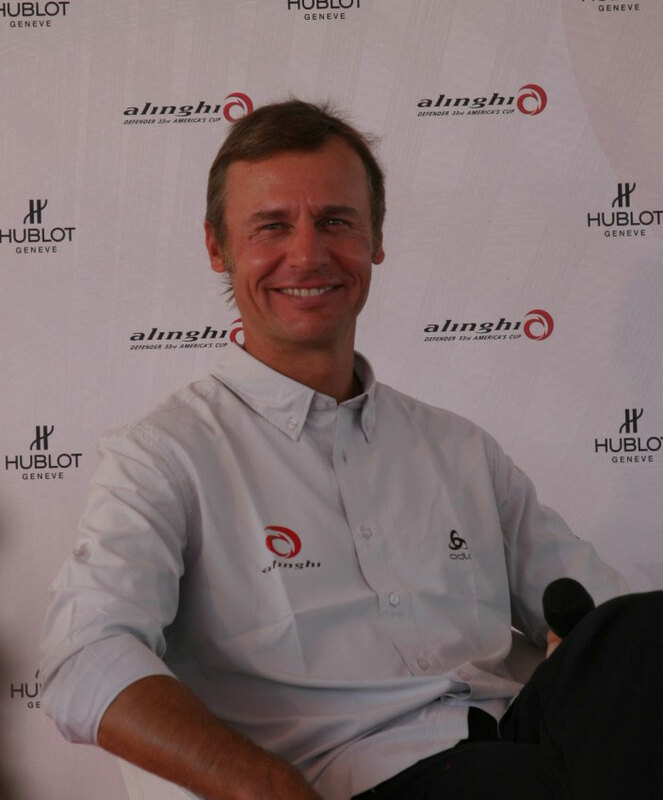 So, there are a lot of commonalities between what Jean-Claude is trying to achieve and what we are trying to achieve with Alinghi. J-C B: We specialise in the use of new materials. Believe it, or not, for 450 years watches were only available to consumers in two colours, yellow for gold and a kind of grey for white gold, or steel, or platinum. So people who wanted to buy and expensive, luxury watch had to buy yellow, or grey, or eventually bicolour. We were the frst brand to get out of this two colour and say we need an additional dimension in watches, we must have more colours and we cannot use paint or power injected treatment, we have to use new materials. We were, for example, the first brand to combine red gold with ceramic and, when I saw the boat, I said “With the materials of this boat, we can produce a great collection of watches.” We are going to produce an Alinghi watch that is using exclusively just materials from the boat. Never, in an Alinghi watch, will there be materials that don’t come from the boat, even the packaging will have to come from the boat. It will be a real souvenir of victory. EB: I’m not sure that Brad isn’t a more appropriate person to talk about sailing, but if he allows me …….. I have the pleasure of helming this fantastic boat in front of Genoa. Yesterday, we sailed past Portofino, which was …….. well, you know. There’s one last thing we must talk about and that's beauty; beauty makes things that are very practical even more pleasurable. I’m passionate about this boat, because this boat is 20 years of experience with multihulls on Lake Geneva; it is the America’s Cup team that won in 2003; it’s the designers that won in 2003, then won again in 2007, it is the sailors that won in 2003 & 2007 embracing this new technology and the melting pot – I’m using an American term – of developing this boat has been a unique journey. I want to thank the Italians; you know that I am born Italian, so there is Italian blood running through my veins, though my home and my business and my country is Switzerland. From the moment that the boat flew under the gigantic helicopter, crossing the Great St Bernard Pass, Italy has been with us. We had a special helicopter from the Italian Aeronautic that escorted the boat all the way to Genoa. Here, in Genoa, the harbourmaster, the Guarda di Finanza, the Customs, everybody has been very welcoming. The press – thank you very much – has covered the event and it’s going to be a sad day for us to leave Genoa, at the end of September, for new seas, but if we are to be successful in the next America’s Cup Italy and Genoa will have been part of our journey. EB: The nice thing about the Emirates is that first they are welcoming us and, when you welcome the America’s Cup, it is a great honour, but it is also a commitment to infrastructure and hospitality and they are making a great commitment. The other thing you look for, like we looked for in Valencia, is a condition that will guarantee – or try to guarantee – as much sailing as you can. The best condition for that is sea breeze and sea breeze is not dependant on general weather patterns, but on the local relationship between sea and land. We should have a wonderful sea breeze in RAK that will allow us to race every day and that’s basically why we chose it. EB: The America’s Cup is a boat race and our strategy is very simple and has always been like that from the first day; try to build the best boat and have the best crew. If you have the best boat and the best crew everything else doesn’t really count anymore. BMW Oracle have to modify their boat; they’ve been telling us for two and a half years now that they are modifying their boat, so they have plenty of time to modify their boat to match the dimensions of their certificate. EB: Brad, was there a moment? Brad Butterworth: There was a meeting in Geneva, in Ernesto’s office, where he got the design team and the sailors together and said “If you guys will commit to it, I’ll commit to it.” and here we are with this fantastic boat. EB: Yes, I remember that meeting and I said “You know we could be going very fast with this boat, we could be flying very high on this boat and we could be having to manage very, very big loads on this boat.” Yes, that was a big moment; we were first designing a 90 foot yacht, then we agreed to change to a 75 foot box rule, but we were constrained – and I have to thank the American team for it – to a multihull. 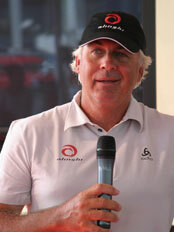 EB: I am so happy today, first because it is an important day for me because of Jean-Claude joining with Alinghi. It is important because, in this challenging journey, we need people who understand what we are trying to do and are willing to commit their name – his name, because you know his history and when he started – so his name and the name of his company. The second reason I am happy is because the America’s Cup is won with a team and, since the beginning, our strength has been the integration of different disciplines and it has been more so with this boat. We have people coming from ocean crossings, Olympic sailing, America’s Cup, from France, Italy, Switzerland, America, all over the world. That’s what makes me happy, when a team works as one and brings talent to work with only one objective. That makes me very happy and, if I can sail on the boat too, that’s more happiness than expected. J-C B: The crisis is behind;, two, three, four months ago you could say crisis, now it is a stage of recovery, so that’s the first task. The recovery is going quite well and the recovery is bringing a lot of hope. During the crisis, we decided – and we are not the only ones - that you should never give up long term objectives for short term. So, during the crisis, we have increased various elements; we increased travelling costs, because in a crisis people have to go out to the market; we made travelling more comfortable, people who travelled economy now travel in business class, so they can travel with more joy and arrive in good shape and really smile; we increased marketing expenses, because in a crisis you can win market share. In a crisis the strong become stronger and we all want to belong to the strong and become stronger. We also increased research and development, because the way out of the crisis is through creativity and innovation. So, we welcomed the crisis, because when things get difficult is when the real racers in the Tour de France come to the front; it isn’t when it’s flat and anybody can cycle fast, it is when it goes uphill and there are headwinds. EB: This next America’s Cup will be about technology and the winner will be decided in two races, so it will be very much less about match racing. 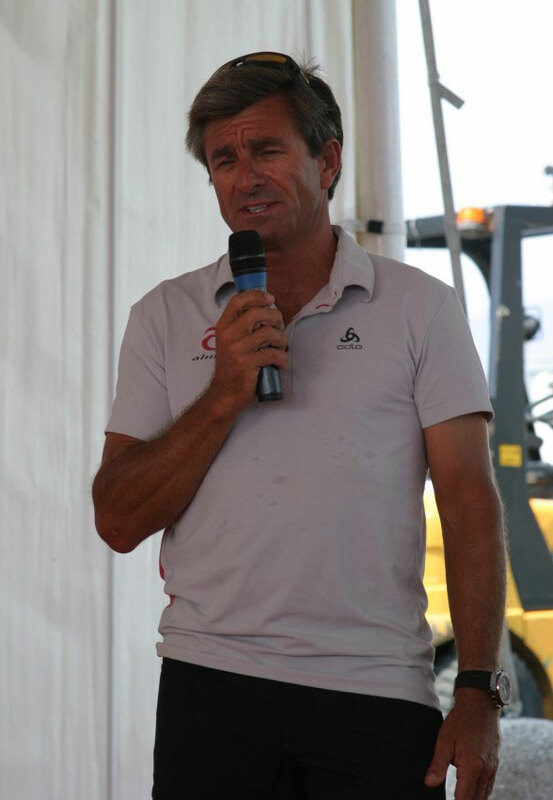 I’d like to introduce someone we are very lucky to have and that’s Murray Jones, because – of all the people in the America’s Cup – he is the perfect blend of innovation, technology and sailing competence. Murray has won four America’s Cups, he was the first sailor to implement going up the mast to look for wind, back in San Diego. 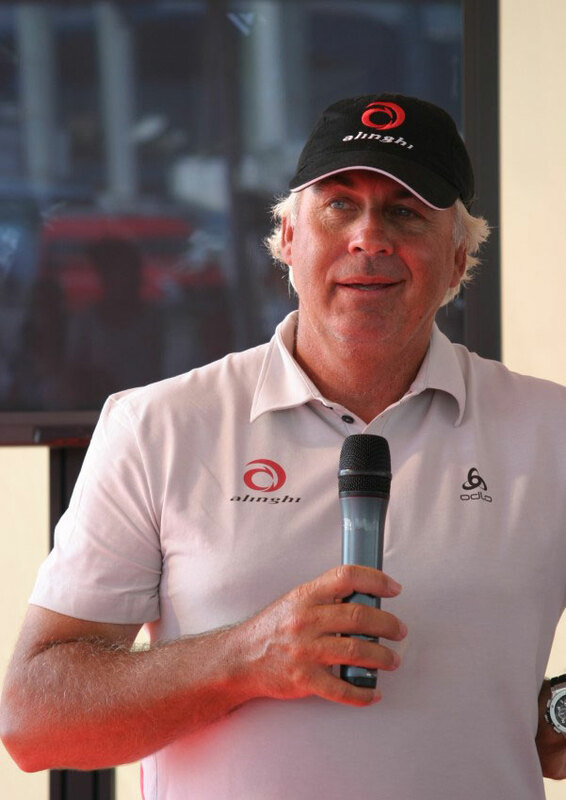 So you know him as a sailor, but what you may not know is that he was the inventor of the criss-cross mast and he is Mr Technology onboard Alinghi 5. 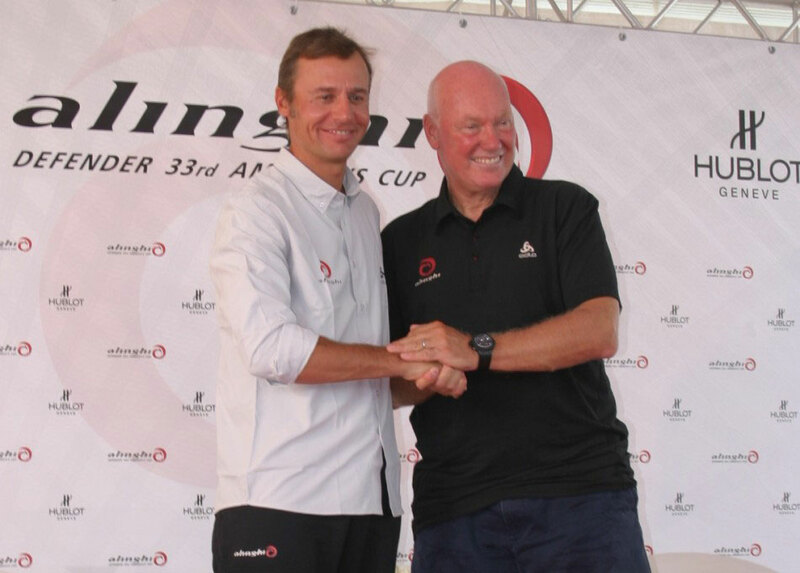 So Murray, what do you think of this America’s Cup and technology versus sailing? Murray Jones: Well, in previous Cups we’ve had technology and sailing, but there have always been restrictions on technology, whereas now there are no restrictions on us. It’s really been exciting to be able to use all these different technologies and have a blank sheet of paper to start with. It’s been a huge challenge, which those of us onboard have embraced with joy. Match racing these boats is something completely different, they are quite difficult boats to sail and the loads on them are just incredible and it will be quite different to the match racing you’ve seen before in the America’s Cup. You can’t get close together, because a coming together would be catastrophic, it’s going to be a different game. EB: Can you answer that question on our sailing program Brad? After all, you go to the gym every morning at 7 and I don’t. BB. We have a big team here, sailors, boat builders, designers and it’s pretty much a round-the clock operation. The boat is completely checked, after every time we sail, so that pretty much takes the night and we try to sail when we have a good breeze. Today, we docked out at 6 am, because the best breeze was from then until midday, You need a forklift to get the sails into the shed and a crane to get them back on the boat, so it’s a big job to go sailing. Out there we go on testing, trying to find the capabilities of the boat, looking for modifications that could make it faster than it already is. So, it’s pretty much a 24 hour operation. Next story: Water ballast, another mast, a wing sail, who will helm, sailing with a computer, the boat for the 34th America's Cup and more.